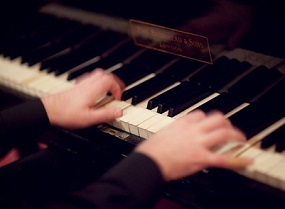 We also represent a number of solo pianists available to hire for a wide range of events. We have Jazz, Classical or modern pianists and you can choose to have background only or with vocals. Whether it’s a wedding pianist you’re looking for or something a little livelier in the evening such as a sing along, we have a number of solid options to choose from. Our pianists are all highly accomplished musicians with a amazing track records performing at private parties, wedding receptions, corporate events and many more. The honeymoon is over and we are back to work. Reality bites! I’m writing to thank you for sending Pianoman Maurice Culligan our way. He is FAB-U-LOUS. We had the best day ever and Maurice entertained us well into the early hours of the morning. Maurice was one of the hightlights of the day. I am his biggest fan. Thank you so much. I wish we could do it all over again, a great day. To book a Pianist for your event or to talk to us about your event requirements, please submit the enquiry form or call us on 087 718 1360.